This book pairs all poler opposites together. It's funny and sad. It's childish and serious. It's happy and dark. It tackles worldwide issues while focusing on a small-time town. Somehow all these elements come together perfectly in this book. The Absolutely True Diary of a Part-Time Indian is about an young cartoonist, Junior, living in a poor Indian reservation. He doesn't want to grow up to be just another alcoholic in the rez, so he transfers to an all-white, privileged school. Even though this book deals with intense issues such as racism, poverty, and the dangers of alcohol, it wasn't all that intense--which was kind of refreshing considering that most of the books I read are very depressing. It's nice throw one in the mix that has a sense of humor and happiness to it. But don't get me wrong, this book was still very sad and touching. The characters were interesting and some were very unique—like Junior's sister, who lived in a basement for 7 years. The setting was also interesting and original. The Absolutely True Diary of a Part-Time Indian kept me interested and flipping pages. I was happy and sad, childish and serious, and laughing and crying the whole way through. Any book that stirs up that many emotions deserves to be read. Honestly, I'm not sure why I decided to read this book. At first glance, it looked like just another story about eating disorders. But I thought I would give it a whirl. Thankfully, Looks turned out to be the opposite of what I was expecting. Looks is about how an obese girl, Megan, and a very thin girl, Aimee, become unlikely friends through their want of revenge on a girl that has done them both wrong. I think this book was unique in the fact that, yes, the two girls have eating disorders, but that's not what the book was about. Usually when there's a character with an eating disorder, that's all they are--"the character with the eating disorder." Aimee and Megan were so much more than that. Though I do think the characters were interesting, the plot was less so. This book was very slow paced. It took me halfway through the book to become interested in the plot. In fact, it took me halfway through the book to even figure out what the plot was. All in all, I have a neutral feeling about this book. I enjoyed it, but it was sometimes boring. It was interesting, yet it was somewhat bland. But hey, at least it's not just another story about eating disorders. It's got some spark to it. I first read this book when I was in elementary school. I'm now in high school and i'm still rereading and enjoying it. Millicent Min, Girl Genius is about Millicent, an eleven-year old genius who is much better at making good grades then making friends. When Millicent meets Emily, a relatively normal preteen, she decides that the only way to befriend Emily is to hide that fact that she's a child genius. You will never meet a character as unique as Millicent. Yet, as unorthodox as she is, she still seems real. The plot is well thought-out and interesting—so interesting, in fact, that Lisa Yee has written two other books describing the same story from different character's view points (both of which I have read.) If you enjoy Millicent Min, Girl Genius then I strongly suggest you read the “sister” novels, Stanford Wong Flunks Big Time and So Totally Emily Ebbs. There's a collection of different settings through out the book that were all enjoyable to read about. Millicent Min, Girl Genius will always have a special place on my bookshelf—no matter how old I am! Life is nothing without meaning. Pierre Anthon seems to believe that meaning doesn't exist, so he climes up a plum tree and refuses to come down. Pierre Anthon's classmates are determined to prove him wrong—so each classmate picks something that has meaning to another person, and that person is forced to add said meaningful item into a pile. But as the sacrifices to the "heap of meaning" become more and more extravagant, the idea of "meaning" is questioned as they wonder if they really found the meaning at all. I am not exaggerating when I say this book is breathtaking. The plot was like no other and the whole idea of the book—the idea of "meaning"—was shocking and thought provoking. Nothing is definitely one of those profound books that make you stop and think. Something I really liked about this book was the view-point in which it was written. Nothing wasn't written from the view of a character whose very important to the story or someone who had to sacrifice something mind-blowing to the heap of meaning—it was written from the point of view of a somewhat neutral character observing the more dynamic character's as they fall apart. There where many characters, but each one was interesting and had their own traits. The pace of the book was consistent. I would recommend this book to readers who don't mind having depressing thoughts planted in their mind after reading all about how life may have no meaning. At the risk of having plums thrown at me by Pierre Anthon from up in his plum tree, I have to say, Nothing is quite a meaningful book. Unique social outcasts + preppy theater kids + an edgy girlfriend = a whole lot of confusion for the main character and a whole lot of entertainment for readers! Pink is about a girl, Ava, who just wants to fit in at her new school. Problem: she doesn't exactly fit in with the popular theater kids, and she doesn't exactly fit in with the geeky outcasts. Through her time spent with the outcasts, popular kids, and her girlfriend, Ava questions who she is and who she wants to be. I have never read a book with so many interesting characters before! I liked how many of the supporting characters' personal problems were addressed in the story, so the book wasn't focused on Ava and Ava only. As unique as each character was, they still seemed real. The pace of Pink is consistent. The setting is interesting because it's set in many places that aren't mainstream, such as a sci-fi convention. I would suggest this book to girls who are sick of cliche, common stories and are looking from something original and new. Basically, Pink boils down to a simple equation: Great characters + an interesting plot + a consistent pace = a very good read. This book looked really promising, but sadly, it turned out not to be not so special after all. Unlocked is about a teen, Andy, who befriends Blake, an outcast who's rumored to have a gun hidden in his locker. When Andy finds out the truth about this rumor he begins to suspect that Blake could be dangerous. I think this plot had so much to offer but it never reached its full potential. Usually I love books written in poems because they send a stronger message and each word hits you like a bullet (no pun intended,) but Unlocked didn't have that impact. It had its “wow” moments, but for the most part it was a mediocre story. Nevertheless, the characters did seem real, especial Blake who I had much sympathy for by the end of the book. The setting was like the plot -- mediocre. Overall, I was a bit disappointed but I'm still glad that I read it. Recently 110 original illustrations for The Hobbit were found among Tolkien's papers in the Bodleian Library in Oxford. Some had been published previously, others had not. 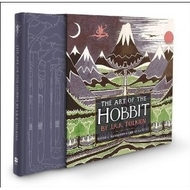 We have a new compilation of these drawings, The Art of the Hobbit, on order.